Proper port placement is crucial during conventional laparoscopic surgery. Likewise, during robotic laparoscopic procedures this concept is equally as important. The da Vinci® Surgical System (Intuitive Surgical Inc., Sunnyvale, CA) in its current form consists of a patientside cart with arms that dock to trocars that are preplaced by the surgeon. These arms are rather bulky and require sufficient room to maneuver. An effective port placement situates the arms so that they provide excellent intraabdominal instrument mobility while minimizing arm collisions. 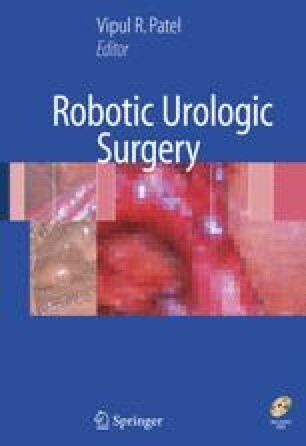 This chapter will describe some tips on port placement classified by procedure to help surgeons overcome the learning curve of this preliminary but crucial step to robotic urologic procedures.